In Part I of this series, I went through the thought process behind my new machine build and in Part II, I documented what was purchased based on those decisions and how much it costed. In this last part of the series, I’ll go through some of the build issues that would help you in case you go for the same machine. So, let’s start! I’ve already mentioned that the motherboard bought is of SSI-EEB form factor while the casing conforms to the E-ATX standard. Before buying, I did some research to confirm that the board is physically of the same size but some of the mounting holes are in different positions. I also confirmed the casing is of a sufficient size not to have its cable-management holes covered by the motherboard, once installed. Hence, the decision in favour of Obsidian 900D. 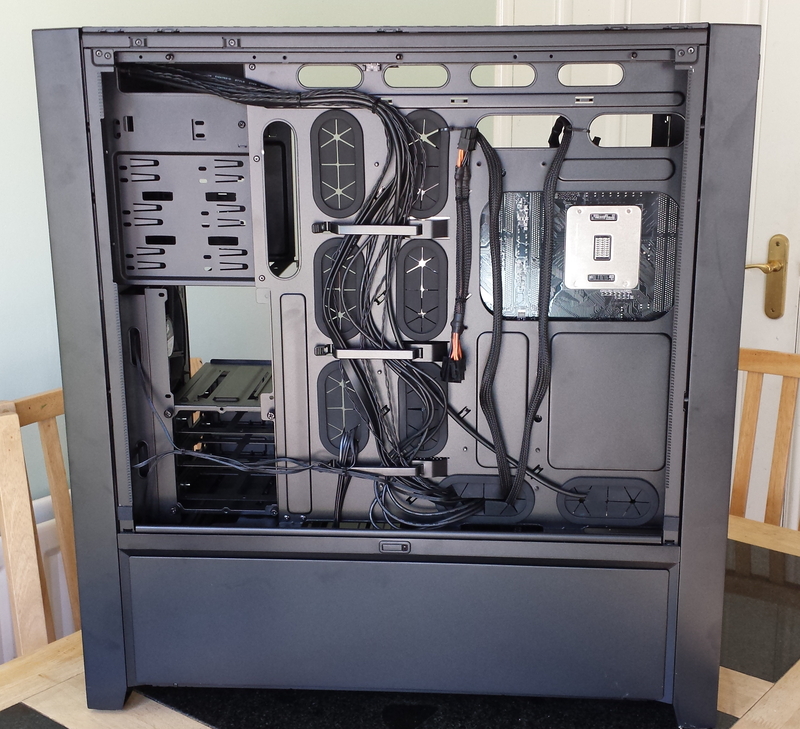 One could possibly go for a slightly smaller case but that’s just preference based on how tidy you want the cabling to be. This is because E-ATX doesn’t have standoffs in those places so there isn’t a hole to put one in. Shame as Corsair could have easily made holes there, making this casing SSI-EEB compatible. As mentioned before, the motherboard is fine without the two missing screws. That said, if you’re determined to put all screws in and a DIY enthusiast, then you may drill holes of your own! Please note that all other mounting holes should be populated. If not, you might have missed one. Once the motherboard is installed, the rest is straight-forward and if you follow the manual, there are no hidden surprises. Now, I always start with the minimum I need to boot up a system, test that and then install the rest. In this case, I wanted to test with a one CPU set up first, before opening the boxes for the other CPU and cooler etc. So, once the board was in with a single-CPU configuration, I tried to boot the system up. The CPU fan ran for half-a-second and then everything switched off. Before buying the motherboard, I knew that I needed BIOS version 5206 (or above) for it to work with the CPUs I bought (ASUS CPU Support Page for Z9PE-D8 WS). Well, 5103 will also work but due to a bug, the combination doesn’t work with non-ECC memory, which is then fixed in 5206. Anyway, the trouble was that I was in a “Catch-22” situation: Motherboard wasn’t doing a POST so I couldn’t check what BIOS version I had and even if I knew, I wouldn’t be able to upgrade until it boots up! It’s understandable if the vendor has sold you a motherboard with an older BIOS version and there is no way of telling before delivery. So, I contacted them in the hope that they will replace the motherboard immediately or will do it via ASUS. I won’t bore you with the long story but they weren’t the fastest! So, I took matters into my own hands and contacted ASUS support directly. In case you don’t know, for high-end motherboards, ASUS now provides an ARS (Advance Replacement Service). So, if you can convince them that you’ve done all the required troubleshooting, then they’ll send you a “refurbished” motherboard, which you can use for testing or as replacement. The guy at ASUS was “very” helpful and once he was happy I had done everything I could, he arranged for the motherboard to be sent via DHL and it was delivered within a couple of days! The service also caters for free shipping back so the cost is not on the customer! Brilliant! That guy also told me a neat way of telling the BIOS revision on the board without needing to boot. 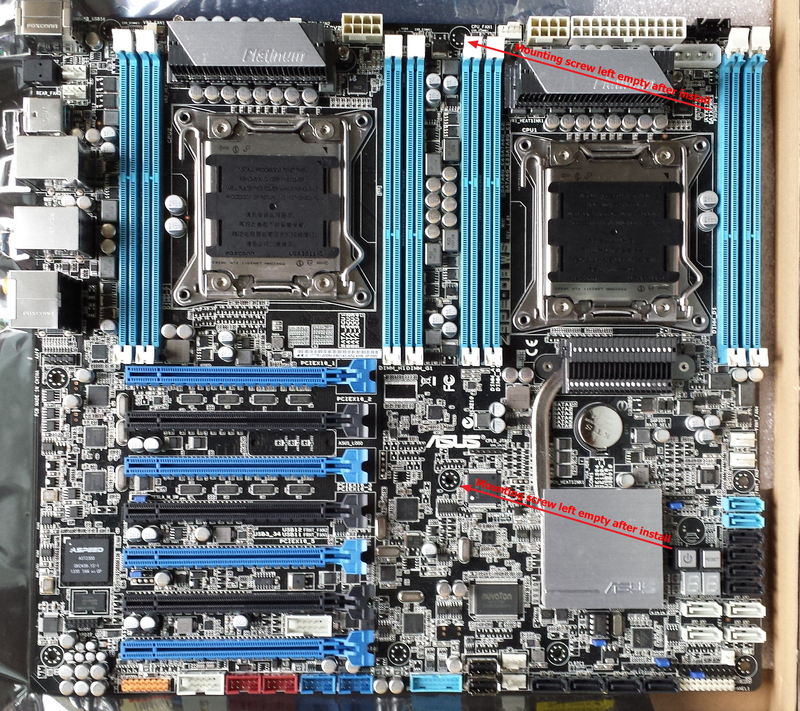 At least with these motherboards, ASUS has a sticker on the board (just above the first PCIe slot in the picture). The second-last bunch of numbers on that board is actually the BIOS revision as shipped. In my case, it did say 5404 (i.e. later than 5206) which confirmed that the fault wasn’t because of a lower BIOS version. With the replacement motherboard in hand, I installed everything and tried booting up. Again, no boot! After a brief moment of head scratching, I remembered that some dual-processor boards will send the power supply a power-off signal if both CPU power cables are not attached (the 8-Pin ones) – even for a single-CPU configuration. Phew! Attaching the second CPU power cable, caused the machine to spring to life and it booted up fine. 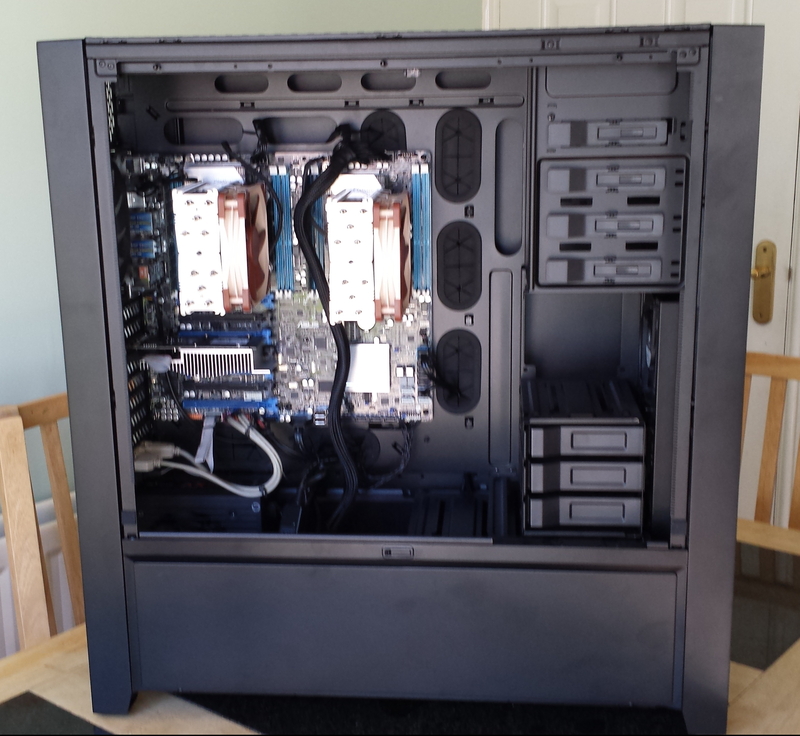 That proved not only the build but also that my components i.e. CPU, RAM, PSU etc. were all good too. That begged the question: What was wrong with my motherboard? Before sending it back, I wanted to have another go at resolving the issue as that would have meant keeping my original new motherboard, instead of a refurbished one. So, I eye-balled the motherboard and noticed that the BIOS chip looked a bit loose and off-center (i.e. its pins were not in the center of the socket). Even though, it seemed like a long shot at the time, I removed it carefully and reseated it properly. Lo-and-behold: The motherboard booted up just fine! Tried a few time just to make sure and then fully loaded the system with both CPUs and RAM etc. No problems at all! Needless to say, it was all plain-sailing after that and I sent the refurbished motherboard back. Many thanks to ASUS for their wonderful support there which was very quick and efficient. Just also wanted to mention that in case you’re in a situation with a motherboard with an older BIOS and wouldn’t boot, you can also buy a pre-programmed chip, widely available on the Internet via eBay or other websites. Just make sure you’re comfortable with handling the kind of chip installed on the motherboard. Fortunately, this motherboard has the 8-pin DIP type in a socket that can be easily removed/replaced. The rest of the build was smooth. The only other thing to mention is that the CPU 24-pin Motherboard power cable bundled with the PSU is a bit short if you want to take it through the cable management. Maybe Corsair should have another one bundled for bigger cases. In the picture below you can see it snaking in between both CPUs. The second picture shows the cabling from behind. Air flow is great and the machine runs so cool that even with reasonable load, the system overall remains below 50 degrees Celsius, mostly just over 40 degrees. All packed up, it also looks pretty nice. Clear side window touch is also pretty cool! Oh, and one final thing to mention: Even though I went for a Windows/Workstation 10 based host, I tested this host configuration with ESXi 5.5 Update 1 and it works just fine so if you want a powerful native ESXi 5.5 based host for nested ESXi, this configuration should suit fine. There is no doubt this is an expensive system but I made the conscious choice of building one that exactly meets my needs in terms of noise-levels, Performance, expandability and longevity, given everything that I now need to run. I am hoping that along with all other infrastructure that I have, I shouldn’t have to invest in compute and/or RAM for another couple of years and if so, this system will have paid for itself and will be running as a bonus as far as I am concerned. Let’s hope that is the case! Please do let me know if there are any questions about these posts or if you would like to brainstorm other options, in case you’re thinking about building something similar. However, would you post how to configure the underlying Nested ESXi environment diagram or the overal big picture ? First of all, thanks for all the likes and interest :-). I do intend to have another post with my environment as a whole and what’s running but currently, there are so many things that are going on that it’s nearly-impossible to do that at the moment. Thanks for the idea and have a great new year!